Citation Information: J Clin Invest. 2018;128(11):5056-5072. https://doi.org/10.1172/JCI97912. Expression of TNK1 causes animal distress, systemic inflammation, and rapid lethality. 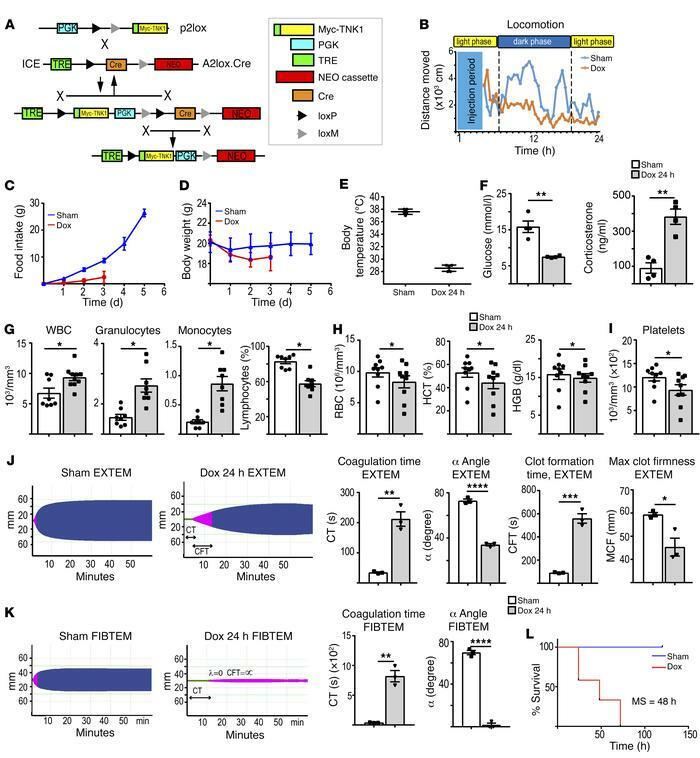 (A) By an inducible cassette exchange (ICE) approach (60), Myc-tagged Tnk1 was targeted to a specific conditionally regulated locus by Cre-lox recombination. (B) Behavior analysis shows that expression of TNK1 impairs locomotion of the animals (n = 6 per group). (C and D) TNK1-expressing mice show signs of cachexia, as demonstrated by decreased food intake (C) and body weight (D) (n = 12 per group, t = 24 hours). (E) Mice exhibit a drop in body temperature upon TNK1 expression (n = 5 per group, t = 24 hours). (F) TNK-expressing mice exhibit hypoglycemia (left) and hypercortisolism (right) (n = 4 per group). (G) Differential blood count suggests systemic bacterial inflammation (n = 8–10 per group, t = 24 hours), as designated by an increase in the total number of white blood cells (WBC), granulocytes, and monocytes and a decrease of lymphocytes. (H) TNK1-expressing mice show a significant decrease in red blood cell (RBC) number, declined hematocrit (HCT), and hemoglobin (HGB). (I–K) TNK1-expressing mice also exhibit a dysregulation of coagulation, as indicated by diminished platelets (n = 9 per group) (I) and rotational thromboelastometry analysis (n = 3–4 per group) (J and K) (t = 24 hours). Prolonged EXTEM (J) and FIBTEM (K) clotting time (CT) and reduced α angle specify abnormal clot formation. A prolonged EXTEM clot formation time (CFT) and reduced EXTEM maximum clot firmness (MCF) indicate abnormal clot formation in TNK1-expressing mice (J, right 2 graphs). (L) Kaplan-Meier analysis shows decreased survival upon TNK1 expression (n = 12). MS, median survival. Data are expressed as mean ± SEM. Differences were tested by parametric 2-tailed, unpaired Student’s t tests (*P = 0.01–0.05; **P = 0.001–0.01; ***P = 0.0001–0.001; ****P < 0.0001).